organize a local focus group to find out the solutions youth in your community need to feel comfortable, supported and respected in your programs and spaces. explain the importance of including questions about sexual orientation and gender identity in local Point In Time counts. understand how to include questions about sexual orientation and gender identity in local Point In Time counts. The youth focus groups occurred in four communities (Guelph ON, Ottawa ON, Toronto ON and St. John’s NL) and as discussed in the Youth Engagement module. The themes and suggestions on how youth serving organizations can better support LGBTQ2S youth were similar in each community. Are these transferable to your community? Most likely they are. We encourage you to engage with youth in your community to find out for sure. There are a number of reasons why LGBTQ2S youth may not be accessing your programs and/or why they may not be out while in your space. 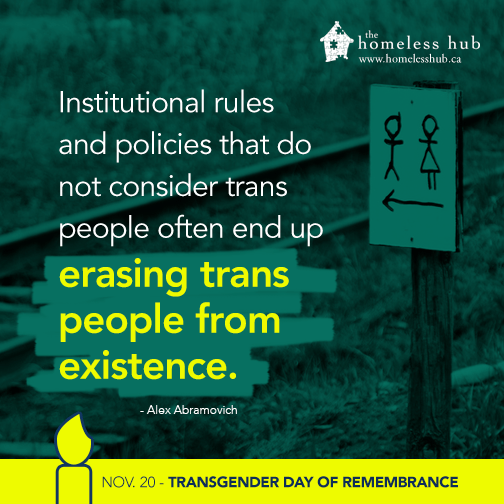 Dr. Alex Abramovich has been researching LGBTQ2S youth homelessness and has a number of publications. It is a great idea to review his work. Youth Focus Groups are an important method for service providers to hear and begin to understand the experiences of LGBTQ2S youth who access our programs. The structure of the focus groups needs to allow for youth to share their experiences in a space and way that they feel comfortable with. Because we had focus groups in multiple cities with different facilitators, we created a facilitator’s guide that is thorough and descriptive. You may use the guide as is or take parts from it that meet your local context and will help you gain the insights you need. For your focus groups you will need to determine what you want to learn more about. For us we wanted to understand how youth we work with needed our policy and procedures to be written and enforced, how our staff need to trained and how our physical spaces should be structured for them to feel comfortable, supported and respected. You may have different questions you need answered. We choose to use scenarios to ask youth how we can improve our programs and services to better support LGBTQ2S youth. We did not want youth to feel like they were obligated to share their worst experiences with us. We wanted to keep youth focused on solutions, as we know the issues/problems. The focus groups ask youth to respond to scenarios and offer their feedback on how organizations can ensure that the youth feel supported, comfortable, and respected. We identified 3 stages of youth interaction with the services (Programs, Workshops, and Drop-ins). These stages are Intake, case management, and exiting. In each of these three stages, the three different programs must be considered. We encourage you to use our guide for your local focus group if you decide to host one. You can compare your results to the ones we shared in the Youth Engagement module. You can also share your results with us and we will add it to our report. Download the Youth Focus Group Facilitation Guide here. This survey has been modified from the Forty to None Project’s Agency Inclusion Survey. 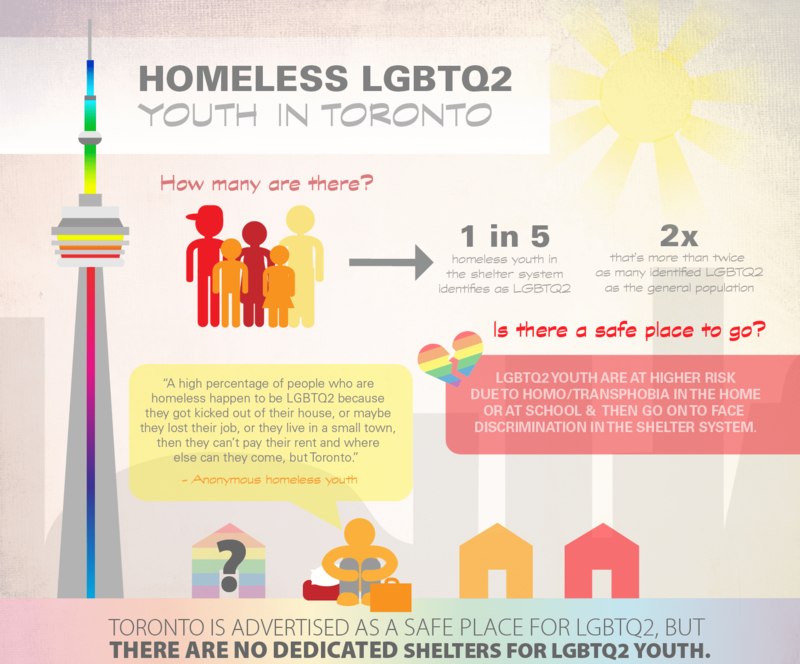 This survey is meant to assist organizations in assessing their current level of inclusive and affirming services for lesbian, gay, bisexual, transgender, queer, questioning and Two Spirit (LGBTQ2S) youth experiencing homelessness. Before completing the survey, please confirm that no one else from your organization has responded. We will share results of the survey on this site when we collect a substantial enough sample size as a summary report. Please contact us if you would like to know how your organizations compares to the national survey. You can measure the number of LGBTQ2S youth who access your services, by updating your forms to include questions about sexual orientation and gender identity. Please bear in mind that this number will be low as some youth will not self-disclose their sexual orientation and/or gender identity. Including LGBTQ youth in your community’s PIT count is an important first step toward getting better data on youth so that appropriate supports and systems of care can be developed. The idea is simple: if know how many LGBTQ youth experiencing homelessness there are, we can better respond to their needs (Shelton, n.d.). If your community is conducting a Point In Time Count, you want to encourage the coordinators to include questions to count how many youth identify as LGBTQ2S. The 2013 Toronto PIT count included questions about LGBTQ2S identities. 21% of youth who were included in the count identify as LGBTQ2S. This number is low for a number of reasons, most significant is perhaps that the survey was asked by strangers who respondents had no relationship with and had no reason to trust with such personal information. Please read Count LGBTQ Youth Because LGBTQ Youth Count for tips on how to include LGBTQ2S youth in your local PIT count.